Fastener rivet clips are wear-resistant and anti-corrosion, will not easily break or crack during use. Widely used for holding on radiator yoke, fender, bumper, splash shield, retainer, mud flap, grille etc. These plastic clips fit with most auto parts with 6mm/0.24" hole, and can fix your parts very tightly. The retainer clips are made of high quality plastic, they are of equal quality to the originals. 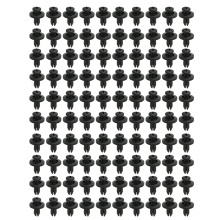 There are 100PCS fastener rivet clips fender & bumper shield retainer are included in the package. Package Size: 13*12.5*2cm / 5.12*4.92*0.79in.